It was the stadium that once housed The Beatles, Bob Dylan, Frank Sinatra. It was the backdrop for a Hitchcock film. After years of closure from the entertainment industry, last summer the iconic Forest Hills Tennis Stadium in Queens reopened with Mumford & Sons as their first live concert in the venue for the first time in years. This summer, it looked as if the tradition would continue with acts like Lil' Wayne and Drake, Modest Mouse and Brand New performing, and for it's closing program, they saved the best for last -- The Replacements with special guests The Hold Steady and Deer Tick. 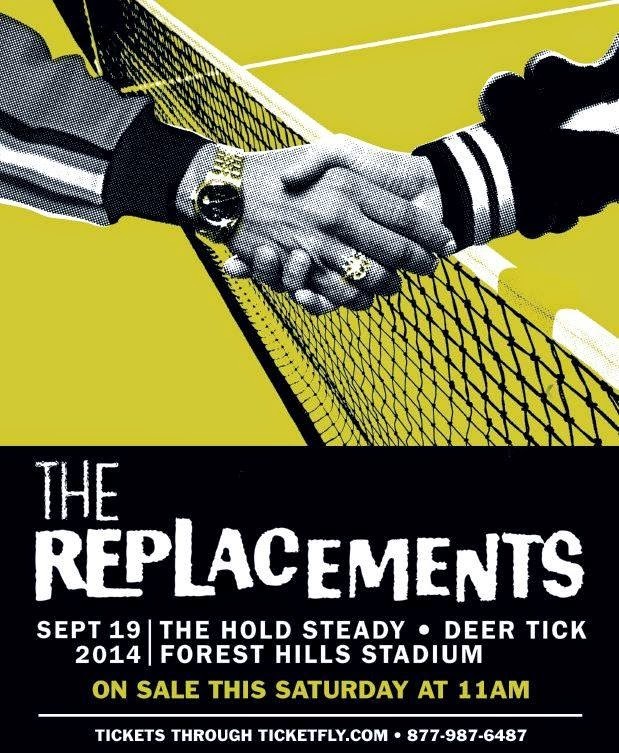 For the first time in over 20 years, The Replacements returned to New York City. "Sup Queens!" bassist Tommy Stinson said to the audience as they strutted out on stage to thunderous applause. The Minneapolis band grabbed their gear and jumped right into "Favorite Thing" and "Takin' A Ride." The audience, which was divided among men in their middle ages and 30-somethings all turned into teenagers again seeing their heroes, a band that has meant so much to their youth, life, and musical taste, back on stage again. An event they never thought they would see again after 1991 when the band played their finals shows. After a long hiatus, The Replacements returned last year to raise money for former guitarist Slim Dunlap, who had suffered a severe stroke, and they performed at Riot Fest and did a few small shows before hitting the festival circuit this year and a small tour of arenas and stadiums. Now, headlining New York City on a Friday night during the final official weekend of summer, it is enough to get anyone excited, but for these fans it meant something so much more. Sure, it is not The Replacements that were hear in the early 90's, the only founding members are Tommy Stinson and singer / guitarist Paul Westerberg, they are now backed by drummer Josh Freese and guitarist Dave Minehan. For the 90-minutes the band was on stage, it was as if they never went on a long hiatus. They sounded perfect and looked as if they were having the time of their lives. Westerberg lead the audience in anthems like "Bastards of Young," "Take Me Down to the Hospital," "Valentine," "Androgynous," and even a Jackson 5 cover of "I Want You Back." With smiles on their faces and even Macaulay Culkin watching from the wings, The Replacements looked like this is going to be a permanent move for them. "You guys are our best audience yet! You are doing a better job at singing the words than I am," Westerberg said at one point. Yet, the crowds biggest reaction would come for "Left of the Dial" and "Alex Chilton." Closing the night with "Unsatisfied," The Replacements left their mark on New York City, just as they did over 20 years prior. Opening the show were Replacement fans and formidable bands, Deer Tick and The Hold Steady. While Deer Tick went on very early, around 6:30, they played to a near-empty arena, but sounded fantastic. With their short, 30-minute set, Deer Tick warmed-up whoever was in the stadium for what was to come. Just after 7, The Hold Steady stepped up to the plate and banged out "Constructive Summer" as fans rushed into the portals and into the stadium. Frontman Craig Finn looked as if he was a kid on Christmas morning singing his songs, saying, "I can't believe we are opening for my favorite band. We just did it last week in Minneapolis, where I grew up. Now, The Ramones are from right here in Forest Hills! When I was 13, I was in a tennis court and someone asked me who my favorite band was, 'I said The Ramones,' the guy said, 'If you like The Ramones, you should listen to The Replacements.' I took the guy's advice and bought whatever the most recent Replacements record was at the time, it was Hootenanny, I loved it. They then became my new favorite band. I just love how we are playing a tennis court in the home of The Ramones, opening for The Replacements. It all comes full circle!" It was a hit packed set that featured new songs "Spinners" and "I Hope This Whole Thing Didn't Frighten You," as well as Steady favorites, "Chips Ahoy!," "Stuck Between Stations," "Your Little Hoodrat Friend," "Stay Positive," "Sequestered In Memphis," and "You Can't Make Him Like You." With just 45-minutes on stage, The Hold Steady brought the fun, the joy, and the energy to what was to come. It was without a doubt, a glorious night to be an indie rock fan.